(Fox News) The Department of Justice issued California another stern warning Wednesday – drop its sanctuary state status or remain in violation of federal law and potentially lose out on millions of dollars. Earlier this month, Gov. 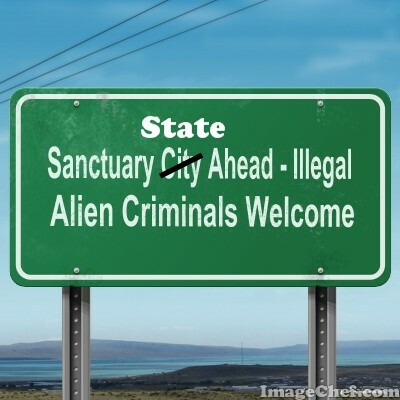 Jerry Brown signed a so-called “sanctuary state” bill which basically erects a wall between California law enforcement and federal immigration enforcement officers. The bill forbids California cops from providing release and other information that isn’t publicly available in response to a request for notification from federal law enforcement. Supporters argue that sanctuary policies allow local and state law enforcement officers to build crucial relationships with immigrant communities. Critics say not turning over people living in the country illegally puts the public in danger. Wednesday’s letter urges California to comply federal statute (8 USC 1373) which bars local jurisdictions from limiting communication with federal law enforcement about a person’s immigration status or whereabouts. The letter states that California’s new law (SB54) “May violate,” 1373. Department of Justice Officials tell Fox News this situation could result with future federal grants being withheld from California, that threat has been a common thread in this ongoing story. However DOJ officials also tell Fox they could “clawback” funds already awarded to the Golden State. This could mean the loss of tens of millions in assistance from Los Federales. Really, though, there’s a better solution: Jeff Sessions should say that all illegals in the US are safe if they stay in California. That ICE and other federal agencies won’t operate in California. And then we watch the state collapse under the weight of having to care for all these illegals, as the schools, criminal justice system, hospitals, healthcare system, etc. are over-burdened. And then the feds should refuse to send extra money. It’s a “be careful what you wish for, California, you might just get it” situation. Of course, that won’t happen. Nor will using the illegal immigration laws on the books about sheltering and helping illegal aliens be applied to California state and local officials. That’s what should really happen, namely, arrest a few and charge them with aiding and abetting illegals in violation of US Code. California is facing a farmworker shortage, and the blame is landing on the country’s changing immigration landscape. Almost 70 percent of farmers around California are reporting labor shortages this year, according to a survey by the California Farm Bureau. Yolo County farmer Jim Durst says he blames his shortage on President Donald Trump. “When people don’t feel safe, and they’ve created a level of hostility in our country, people go into hiding they become incognito,” said Jim Durst. Well, then they shouldn’t be hiring illegal aliens. It does show that Trump’s immigration push is working.